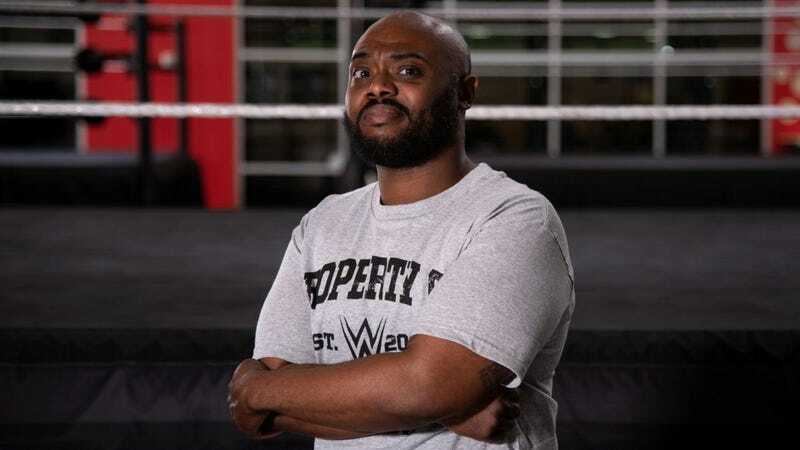 Stokely Hathaway pleasantly surprised the wrestling world last Monday with his arrival at the WWE Performance Center. When WWE announces a new class of signees for its Performance Center in the Orlando area, the notable names tend to go public in advance. WWE infamously instructs its incoming talent not to tell anyone, but those wrestlers still have to finish up their independent dates before joining the promotion, and that kind of disruption in the booking calendar sends a clear message. Last week’s announcement, though, was not the typical one. While Impact Wrestling veteran Rob “Robbie E” Strauss was rumored to have been tabbed for months and the second generation wrestler/ex-UCF tight end Cal Bloom had attended December’s tryout camp, the third name in WWE’s small new class wasn’t on anyone’s radar. That would be independent manager Stokely Hathaway. He had no major storyline loose ends to wrap up on the indies and had otherwise done an exemplary job keeping his hiring secret, but not a lot of fans would have guessed that Hathaway would be part of the class. He’s a manager, after all. Back in September, Hathaway finished up with WWE-affiliated feeder promotion Evolve just days before WWE introduced new managers on Raw, but did not show up in WWE. Nothing leaked out about what ended his tenure with Evolve after two years, and even the off-the-record rumor mill was quiet. There seemed a distinct possibility that he may have missed his window, but that’s clearly not the case. This is good news for Hathaway and probably also for WWE—he’s easily the best manager currently working in wrestling, and one of the the business’s biggest overall talents, period. But his signing also suggests also means that the WWE’s recommitment to managers is here to stay. WWE has long had a strange and fraught relationship with managers. Vince McMahon’s father, Vincent James McMahon, ran his northeastern territory using managers as long-term focal points. The trio of Captain Lou Albano, “Classy” Freddie Blassie, and The Grand Wizard were the promotion’s constants during the 1970's and early 1980's while a slew of villainous challengers rotated into the promotion to challenge the virtuous champion. On the surface level, none of that was drastically different from how other territories used managers. But in practice, there were two huge differences in how WWE used its managers. They generally just worked the TV tapings every three weeks, the monthly Madison Square Garden show, and other major monthly arenas like the Philadelphia Spectrum and Boston Garden, but managers still got paid as if they worked nightly. In a big money territory, it was considered about as cushy a job as one could get in pro wrestling. (This was doubly so for Blassie, who, while a master talker and bonafide legend, was not just aging but increasingly debilitated by a myriad of health problems.) Even when managers worked the road shows, they usually returned to the locker room after the introductions. But though the company was built on managers and was long the home of Bobby Davis, who set the template for everyone who came after him during his run in the 19j50's and ’60s, the role eventually vanished as a constant from the modern WWE. Managers never fully disappeared, but the term is all but gone; the ones who are there are generally specific to a certain wrestler, with nobody leading a stable of villains as past managers did. When there’s a hot new heel with upside in every area other than speaking, there’s no Jimmy Hart, Bobby Heenan, Jim Cornette, Freddie Blassie, Lou Albano, Grand Wizard, Tony Angelo, or Bobby Davis to bring him or her in as their newest recruit. Legend has it that managers—like strong tag teams, wrestling rings with industry-standard cable ropes, and even words like “belt”—are considered “too rasslin’” by Vince McMahon. Why these particular things got caught up in his weird and seemingly self-loathing complex with “southern” wrestling is not usually clear; McMahon is from North Carolina, after all, and wrestling is his business. (The ring ropes are the exception, as his father’s rings used the regular braided rope seen on modern WWE ring.) Whatever the reason, it stuck. Paul Heyman is Brock Lesnar’s “advocate” and was previously his “agent” but has never been his manager; Zelina Vega is Andrade’s business manager; Lana was originally introduced as Rusev’s “social ambassador.” Lio Rush, who joined Raw in September, is Bobby Lashley’s hype man. Drake Maverick as the Authors of Pain’s manager is the exception, as that’s what they call him. Maybe they just ran out of synonyms. That managers have returned to the sport at all is still a fairly new development. A look at the winners of the “Best Non-Wrestler” award in the Wrestling Observer Newsletter’s annual voting, the longest running “insider” fan awards, reveals that both in WWE and industry-wide, there just haven’t been that many high level managers since Manager of the Year was dropped in 1997. There’s seven-time winner Paul Heyman, two-time winner Larry Sweeney, and maybe 2011 winner Ricardo Rodriguez, functioned like a manager at ringside. The rest of the winners were usually evil or occasionally neutral authority figure characters of some kind. It’s only now that WWE is starting to feel like a place where a manager could thrive again. In Hathaway, they have picked a performer talented enough to finish the job of bringing managers back. Stokely can wrestle pretty well if needed, too, and he had been spending a lot more time doing just that as of late. But he is absolutely at his best when he’s expanding the old-school pro wrestling manager role into something that feels completely natural in 2019. And unlike most recent WWE signings, he occupies a unique enough space that he has a significantly lower likelihood of being warehoused to keep him away from other companies while being used as a tackling dummy for ex-football players at the Performance Center. Except for unanswered questions about how much of the unadulterated indie Stokely will be permitted to make it into WWE programming, it’s hard to look at this as anything other than good news for now. And how often does that happen?